I talked a couple of days ago about this shower-time duo from Forever Living; the Relaxation Shower Gel has a lovely relaxing scent of Lavender and leaves my skin feeling super-soft, as well as being lovely to shave with! I was actually really surprised as my skin can be so sensitive when it comes to shaving, but I've had no irritation at all using this. 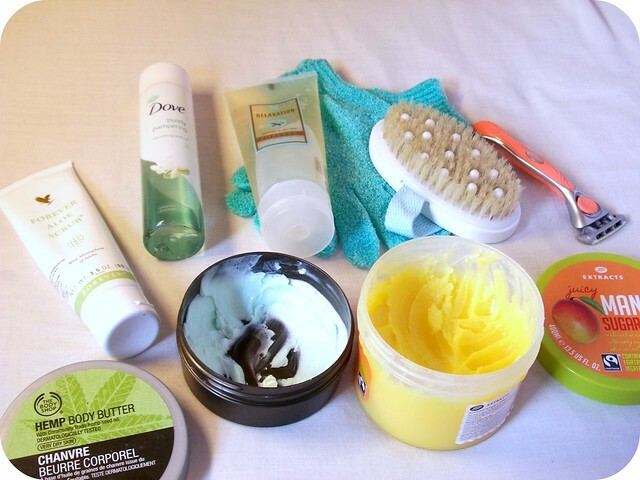 I like to use it with a pair of exfoliating gloves to help keep my skin super-soft. The Aloe Scrub is perfect on my upper arms, and has worked brilliantly to keep peeling at bay when I've spent a little too long in the sun *slapped wrist*. Once a week or so, I like to go in with a more intensive scrub on my legs, which are quite prone to ingrown hairs; the Boots Extracts Mango Sugar Scrub smells every bits as beautiful as it sounds -perfect for summer - and leaves my legs feeling amazing. I also picked up a dry body brush lately and have been trying to give my legs a good brush once or twice a day; it's meant to be really good for cellulite as it improves your circulation, but I'm just loving how soft my skin feels afterwards! Finally, for a nice dose of moisture, I'm loving The Body Shop's Hemp Body Butter, especially after swimming or shaving, which can both dry my legs out. For a lighter option, the Dove Purely Pampering Pistachio Cream & Magnolia Oil smells bloomin' gorgeous and gives a lovely sheen to my skin. It's not the most moisturising of products, so I only use this on days where my skin hasn't taken any abuse - but it still feels like a nice treat! 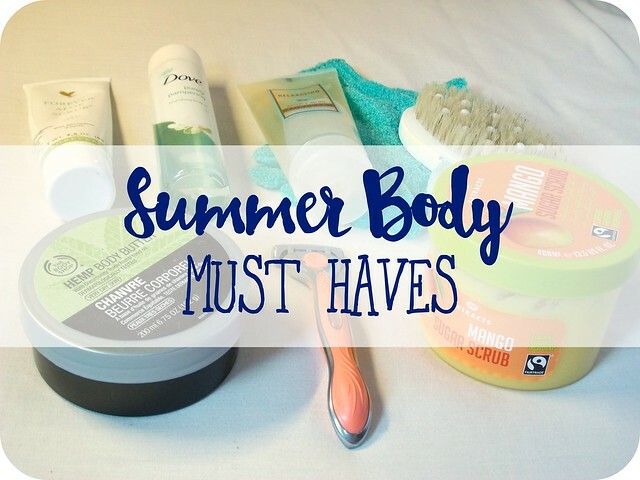 What are your summer body must-haves? What products do you always bring out when the sun starts to put in an appearance? Oh I am now going to check out your summer body must haves. I tend to not switch up my routine other than adding more summer smells like coconut haha. I always love discovering new beauty products and these all sound wonderful! I especially like the sound of the Relaxation Shower Gel - lavender is so relaxing. The Mango Sugar Scrub sounds fantastic too. scrubbing scrubbing scrubbing for life!!! I totally do the same..then I apply self tanner because I don't like my mozzarella skin otherwise..on the other hand, after holidays I lay off scrubs and just moisturize everyday to keep my tan as long as possible! There are some interesting products there, it has been a while since anything from The Body Shop has grabbed my attention. I totally agree! I'm not all that obsessed with trying to be fit in the summer. Mostly I'm concerned with sun protection and not feeling like a lizard! The Body Shop Coconut Body Scrub is one of my all-time favorite summer essential products. It smells delicious, and I love that it stays scrubby and doesn't start to dissolve away like sugar or salt scrubs do. Ohhhhh that Mango Sugar Scrub not only looks fabulous sounds fabulous too!! Although I hate to shave my legs, Texas is NOT a state you can wear pants all the time in the heat, so gotta do what I gotta do!! LOL-have a great week! I love this post! I always tell myself I need to look after my body more. Never thought of a scrub when it comes to ingrown hairs especially on my legs too. I need to test out the Boots Mango Sugar Scrub. Thanks for the heads up. Saying that though... I haven't had much a reason to get me ol' legs out ... Where is summer?!?! I love the Body shop coconut body butter, I heard the hemp one was amazing! Lovely post, thanks for sharing.